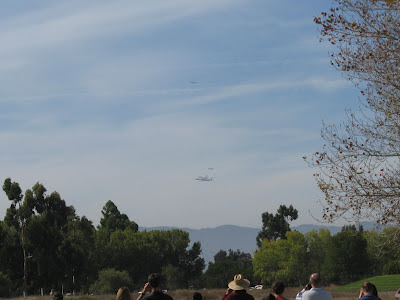 The historic flight of Endeavor Shuttle flying on NASA 747 Shuttle Carrier left this morning from Edwards Air Force Base flying over Sacramento, San Francisco and Silicon Valley (near Moffett Field). 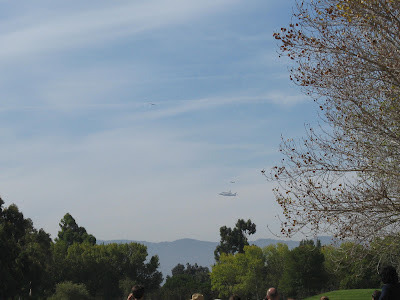 Although I was not quite positioned to catch the best view and my pictures show as a "dot" in the sky ~~ it was fun to gather with everyone to see the Endeavor on its finale voyage. I saw people pull their cars off on the side of the road in order to get a glimpse of this. 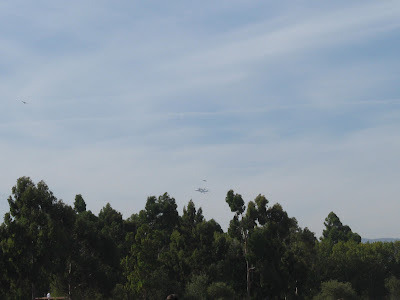 I was playing the live stream from NASA Ames Research website showing the crowd gathering at Moffett Field while I snapped this series simultaneously. Picture A - this is interesting as it captures Endeavor with a bird flying in the top third of the picture. 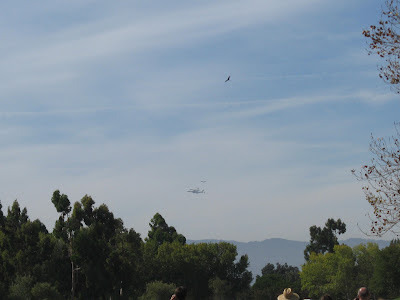 You may read more information on Endeavors historic flight in this Mashable article. And a recorded copy of the live stream from Ames Research Center at Moffet Field. You will find the shuttle at 8 minutes into the video.